A very nice article, summing up the whole issue. Just a small comment on the issue of attributing the Syrian war to climate change: whomever knows this region a bit (I come from nearby Lebanon), will tell you this is complete nonsense. Who invented it is a simple ignorant, and climate change zealot. Political and religious tensions are the root cause of it, not droughts. The mass murderers ho were or still are governing the different countries over there are the root cause, not climate change. I think ghassan‘s point is valid. The pertinent place to note the primary false premise of the claimed linkage between Syria’s political decline and climate change was in the first paragraph in which the issue was cited. While noting the contradictory evidence, in a somewhat controlled-conditions experiment, between Israel and Syria (or any of the other surrounding countries), is interesting and salient to the thesis here, it is also reasonable to point out that it is misleading to present it as if it is the primary underlying false premise. Will Boisvert ==> Absolutely Marvelously Done! Human greenhouse emissions are not raising the seas, at least not significantly. Since the last seventy years of heavy GHG emissions, and the arguably-consequent warming, haven’t caused any detectable increase in the rate of sea-level rise, there’s no good reason to suppose that the next seventy years of GHG emissions will cause a major increase in the rate of sea-level rise, either. You statement that there’s no good indication that SLR will increase in the next 70 years is baseless. There are plenty of indications if you know where to look and I suspect you’re not looking. Here’s a great presentation to watch to lay it out for you. 15,000 years an event called Meltwater Pulse 1A took place and SLR increased 50-80 feet in 400 years. That’s a rate 10 times faster than the current rate of SLR. Maybe you mull over the precedent and figure out how you summarily dismiss the possibility of recurrence before you conclude something similar isn’t about to happen again. That “precedent” is inapplicable. The water which fed Meltwater Pulse 1A didn’t materialize out of thin air. It occurred during the fastest retreat of the great Laurentide, Fennoscandian & Cordilleran ice sheets. Those ice sheets are gone, so they can’t melt now. Predictions by climate alarmists of comparable sea-level rise in the 21st century are contra-scientific. 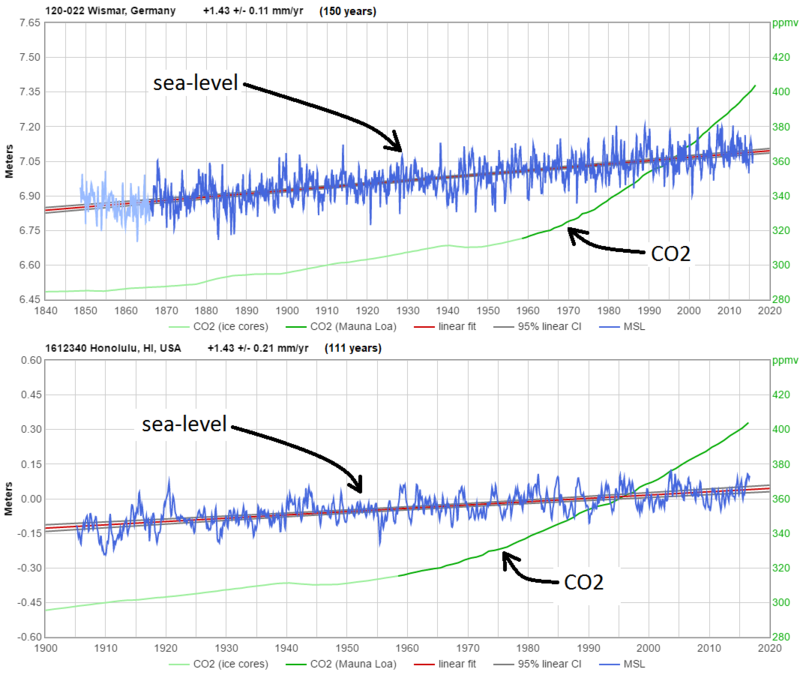 The observational fact is that 2/3 century of very heavy CO2 emissions and steadily rising CO2 levels have caused no detectable acceleration in the rate or sea-level rise. We’ve done the experiment, and we’ve seen the result. The last ~2/3 century of increasing CO2 levels and emissions have caused no increase at all in the rate of sea level rise. It is irrational and unscientific to expect that repeating that experiment over the next 2/3 century will have a significantly different result. Where do you think meltwater on the scale of Meltwater Pulse 1A could come from? Not Antarctica: It averages more than 40° below zero, so a few degrees of warming obviously won’t melt it. Antarctic ice accumulation & loss are in almost perfect balance. Some studies show it is gaining ice, some show it is losing ice, but all show that the net rate, whether positive or negative, is so tiny that it could cause less than 3 inches of sea-level change per century. Greenland is losing ice mass, most years, but not much. The best estimates are that it averages around 50 ±25 cubic miles per year, which could contribute at most about 3.1 inches of sea-level rise per century. That’s nothing new. Greenland has been losing a little bit of ice for a very long time, and human emissions of GHGs are not the cause. Whats more, we know that during the MWP Greenland was significantly warmer than it is now, without causing any notable sea-level increase elsewhere in the world. We know that because the Vikings were able to grow barley there, and it is too cold to grow barley there now, even with modern, quick-maturing cultivars. We know that a warming climate causes processes which both increase and decrease sea-level rise. Based on the sea-level measurement record, it seems that when there’s no Laurentide ice sheet those processes roughly balance each other. Sea-level is rising no faster now than it was >85 years ago, when CO2 was under 310 ppmv, and CH4 was 1.0 ppmv. A 30% increase in CO2 and an 80% increase in CH4 have caused no acceleration at all in the rate of sea-level rise, and there’s no reason to suppose that similar future increases will cause dissimilar results. Thanks, Rich, for the link to that Eric Rignot presentation on the Climate State youtube channel. Unfortunately, you can’t read my comment, because it is “ghosted” — meaning that it is invisible to everyone except me. Unfortunately, I had forgotten that “Climate State” censors youtube comments on their videos to prevent criticism. They did it to me in the past, on another video, but I had forgotten about it. That’s a frequent problem with climate alarmist channels and blogs. Many — perhaps most — of them are censored to prevent dissent. So the errors go uncorrected, and unsuspected readers and viewers continue to be misled. That’s a common practice used by “climate communicators” for climate alarmism messaging. Your comments seem well-informed, but you fall into the same trap as your most vociferous opponents — you overstate your side. This is argumentation, not reasoned analysis. It is like arguing that you should buy a new car instead of paying for fire insurance because the new car brings myriad benefits, whereas your house burning down is only “hypothetical.” The worst effects of climate change are only “hypothetical” because they haven’t happened yet. Once they do, it will be too late. In the meantime, yes we should figure out how to make the most of increasing CO2 levels and the benefits that they do have, while also preparing for the worst. That is just common sense. I trust that you do not deny that today’s climate is preferable to the climate of 1750 AD. Right? It actually takes 362 gigatonnes of ice melt, if the melting ice is all above sea-level, to raise global sea-level by one millimeter. It takes even more if some of the ice is below sea-level. #1. In the first place the claim that pretty soon there will be no Arctic sea ice in the summer months is in defiance of all observational evidence. #2. The sea ice minimum is not in “the summer months,” it is at the Fall Equinox, in September — when the sun is quite low in the sky. #3. More fundamentally, the Arctic Ocean doesn’t get most of its heat by absorbing sunlight, it gets it from air and water currents from lower latitudes. That’s why the Arctic is so much warmer than Antarctica. More open water causes accelerated evaporative heat loss from the ocean. What’s more, all that talk about Meltwater Pulse 1A is irrelevant. The water which fed Meltwater Pulse 1A didn’t materialize out of thin air. It occurred during the fastest retreat of the great Laurentide, Fennoscandian & Cordilleran ice sheets. Those ice sheets are gone, so they can’t melt now. Predictions of comparable sea-level rise in the 21st century are contra-scientific. Whats more, we know that during the MWP Greenland was significantly warmer than it is now, without causing any notable sea-level increase elsewhere in the world. We know it was warmer there then because the Vikings were able to grow barley there, and it is too cold to grow barley there now, even with modern, quick-maturing cultivars. A warming climate causes processes which both increase and decrease sea-level rise. Based on the sea-level measurement record, it seems that when there’s no Laurentide ice sheet those processes roughly balance each other. The magnitude and importance of snowfall on ice sheet mass balance (and thus sea-level) is illustrated by the story of Glacier Girl. She’s a WWII Lockheed P-38 Lightning which was extracted in pieces from beneath 268 feet of accumulated ice and snow (mostly ice), fifty years after she made an emergency landing on the Greenland Ice Sheet. Do the arithmetic and you’ll calculate an astonishing number: more than 5 feet of ice per year, which is equivalent to more than seventy feet of annual snowfall! So, the key question is: what happens to snowfall in a warming climate? The answer is that it increases, for two reasons. First, it increases simply because warmer air holds more moisture. Every meteorologist knows that the biggest snowfalls occur when the temperature is not too far below freezing. When additional snow falls on ice sheets and glaciers, in adds to ice mass accumulation and subtracts from sea-level. So, which effects are greater in a warming world? Those which decrease ice mass and increase sea-level, or those which increase ice mass and decreases sea-level? The best evidence to answer that question is history, because we already have some experience with the effect of temperature changes on sea-level. What it tells us is that those opposing processes must be very similar in magnitude, because the approximately 1°C of warming which the Earth has experienced since “pre-industrial” (Little Ice Age) conditions was associated with only a very, very slight acceleration in sea-level rise, all of it more than 85 years ago. Sea-level is rising no faster now than it was >85 years ago, when CO2 was under 310 ppmv, and CH4 was 1.0 ppmv. A 30% increase in CO2 and an 80% increase in CH4 have caused no acceleration at all in the rate of sea-level rise, and there’s no reason to suppose that similar future increases will cause dissimilar results. Dave, to your most recent reply, it is NOT true that CO2 only yields current benefits. Ocean acidification, a related, but separate, matter to climate change is primarily caused by the overproduction of CO2 emissions. I am not going to debate your other points because they are not relevant. That is a HUGE claim to say it ONLY yields benefits. Most things have pros and cons, ESPECIALLY a greenhouse gas. Chandler, wherever did you get the idea that harm from so-called “ocean acidification” is anything other than hypothetical, thus far? The “problem” of ocean acidification is purely speculative. In the first place, the oceans are alkaline, not acid, and no amount of CO2 emissions can change that. Additional dissolved CO2 just makes seawater slightly less caustic. The greatest effect is on surface water, but AR5 estimates that the average pH of ocean surface water has decreased by just 0.1 since the beginning of the industrial era. Ocean pH variations with time, location, basin & depth are all much, much greater than that tiny change. Yet those pH much larger pH variations do not seem to cause problems for marine life. Note that there’s 50x as much CO2 dissolved in the oceans as there is in the air, and only about 1/4 of the CO2 which mankind emits ends up in the oceans. So CO2 emissions have only a slight effect on the oceans. 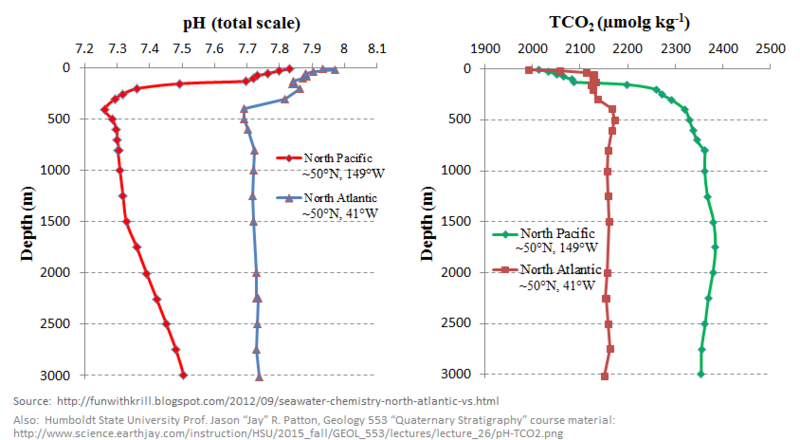 Also, ocean chemistry buffers changes in pH due to carbonic acid from dissolved CO2. I have reblogged this to my site, I hope that is okay with you. In our life time, there might not be much problem with climate. However the kids may be living on a more hostile planet. this is utterly outdated reductionist thinking. Most environmentalists are also socialists and understand that climate change is about justice and unpredictability of world economics. Your argument amounts to: heat is good. That is childish. GLOBAL heat is destabilizing. Also, you are comparing apples to oranges. China and India are not Saudi arabia. Consuming more energy is dangerous and objectively impossible without redistributing wealth. Robots doing outdoor work plainly silly, and science fiction. You are not fooling me. Many environmentalists and socialists have no idea about cause and effect, unintended consequences, the unpredictability of climate. Imposing your kind of justice is simply an excuse for totalitarianism. Your argument seems to be that warmth is bad, dangerous and scary. Now that is really childish. Perhaps you should try spending a winter day in Canada without clothing housing or any unnatural source of warmth. You also seem to be telling me that you are not intelligent enough to adapt to a degree or two of warming. I feel sorry for you. You must spend your days shaking in fear and attempting to frighten children. Read the above article again. Perhaps you will find a little reassurance. You should spend a day in any part of the world ravaged by the forces of nature. Yes, man is intelligent, but economics aren’t. We can rebuild Houston, but Africa can’t rebuild so easily. These are basic facts. Perhaps you should spend a day in Death Valley with no shelter or water. Hint,” Death Valley” isn’t just a pretty name. Although questioning the validity of the CO2/warming mechanism has generally been viewed as naive and unintelligent, some recent developments have suggested that a second look might actually be advised. It’s clear that the world 1) has warmed by about a centigrade degree over the past 50 years or so and that global temperature 2) remains elevated, but that 3) except for a major but temporary El Niño weather event, it has not significantly increased since 1998. This inconvenient reality differs from the CO2/warming mechanism as envisioned, which calls for temperature to increase in proportion to steadily rising atmospheric CO2 concentration, but this no longer appears to be the case. Does this mean, therefore, that we have yet to identify a more credible warming agent? Perhaps the first step in answering this important question is to identify any time periods during which global warming has actually occurred. In temperature time series that haven’t been tampered with, this condition is only met by the 24-year interval from 1975 to 1998. It was expectably (if unscientifically) assumed that the excellent correlation between rising atmospheric CO2 and rising temperature during this interval indicated a causal link, but for the 20 years since 1998, any such correlation has been lost. Before 1975, there also was no such correlation. What happened, then, between 1975 and 1998? This was the period in which anthropogenic chlorofluorocarbons (CFCs) were introduced into the atmosphere before the Montreal Protocol was ratified to stop CFC production in the 1990s. It was recognized at the time that the photodissociation of CFCs released monatomic chlorine, causing the depletion of Earth’s ozone shield. This is still happening, since the depletion is catalytic and both CFCs and chlorine have long residence times in the atmosphere. A thinned ozone layer allows more solar ultraviolet-B radiation to reach Earth’s surface, where it is known to cause severe sunburn and genetic defects, but clearly something that can cause these can also cause global warming. In support of this, total atmospheric equivalent chlorine, mainly derived from anthropogenic CFCs, is well correlated with the full temperature record, including the “global warming hiatus” since 1998, which may be seen as due to ratification of the Montreal Protocol. Also, non-aerosol-producing basaltic volcanoes, such as Iceland’s Bardarbunga, which, in 2014-15, underwent the world’s largest basaltic eruption since Laki in 1783, emit chlorine and bromine in the form of HCl and HBr, and these emissions likely also depleted ozone, which then led to the great El Niño of 2015-16. This concept, too, conforms well to the record of global temperature. Note that, to my knowledge, ozone depletion is the only credible alternative mechanism to CO2/warming, and it does a far better job than the latter of accounting for the actual behavior of Earth’s full global temperature record. Consequently, efforts to mitigate CO2 emissions are likely futile, and should therefore probably be abandoned and replaced by a concerted effort to mitigate further atmospheric emission of halogen-bearing compounds. I would welcome your thoughts on all this. Water is an important greenhouse gas. As temperatures rise guess what? The amount of water in the atmosphere increases. Not a single reference to any of the other species with whom we share this planet (oh, wait, there’s a reference to insects buried in there somewhere). Yeah. I seem to recall reading something about extinction level destruction of species of late. No matter tho. We are already manufacturing robotic dogs and dragonfly surveillance cameras. We can use them to pollinate our fruit trees. He has no clue about the complexities of the environment. We already have unleashed diseases by accident when we modified the environment, AIDS and ebola are examples. There are cascading impacts we no little of, so prudence says go slowly. Only cataclysmic? Gee that makes me feel better. Obviously he is assuming he and/ children and/or grandchildren will survive. Which is not guaranteed. I hope he realizes that climate change will destroy both this source and the Colorado River as a source of water as snow pack shrinks over the years, even under optimistic scenarios. CA won’t be the only place this happens. He also cites huge infrastructure which costs billions to maintain. There is no will these days to invest in infrastructure. Not without water. Water is the key and climate change the threat. 1) you need water which is disappearing. 2) most farms are too large to cover entire crops. You are talking about building green houses. As any green house operator how much effort it takes to keep blights and infestations out of green houses. I think I know where he gets his money. BTW, fracking is done mostly with water. If indeed water is such a problem, then why has global warming only become a recognized problem within the past 50 years? The only sensible answer to this question is that we have added some new component to the atmosphere within this time frame. CO2 is the obvious choice, but it’s turning out not to have the warming effect expected of it. Chkorine from anthropogenic CFCs, on the other hand, does have such an effect. Global warming wasn’t much studied or discussed before the 70’s. Remember back then computing power was low, there were no satellites, global exchange of information was slow and expensive. BTW, H2O (or dihydromonoxide as the joke goes) is an important GHG which increases in the atmosphere as temps. rise. Creating a feedback cycle. I live in NEOH, just west of the fracking counties of my state. Water is used only in the initial cracking process. Once gas is escaping, water use ends. Water is so cheap in this area that it doesn’t pay to recycle frack water, so it is injected back under ground. If water scarcity ever increased market prices for water above the cost of recycling, ghen frack water will be cleaned and sold. Economic realities will guide man’s actions in the face of unavoidable climate change…. How much water does it use per year. In the US, I’ll let you off the hook on other places. I have read that frakers inject chemically treated water into the ground, chemicals that they will not identify. Thus the growing concern about pollution of aquifers. Ever see that video of the woman running flaming water out of her tap? Mr. Lopez, you are an astute and observant individual. AIDS is easily avoided with condoms and circumspection, and we now have an effective vaccine against ebola. Ongoing development in medicine and public health will steadily reduce the problem of infectious disease. Not “destroyed,” possibly lessened. But as the snowpack dwindles as a storage reservoir, other storage infrastructure—more dams and reservoirs—can help make up the difference. In a worst-case scenario, desal could suffice. The Colorado River has a discharge of about 16,000,000 acre-feet per year; if the river ran dry that entire volume could be supplied by desal for about $11 billion per year at Israeli prices, a tiny fraction of the GDP of states that draw water from the river. Huh? Trillions of dollars are invested in new infrastructure every year, and gigantic new cities have sprung up around the world in recent decades. I don’t understand where this is coming from. Water is not “disappearing.” As you note upthread, Pedro, a warming atmosphere holds more moisture, which means that on average earth’s climate will get wetter. No, Pedro, we’re talking about closet-sized cooling tents (or maybe trucks) for workers to take a break in, not covering entire farms with air-conditioned tents. (1) They increase the Earth’s albedo, which will increase the amount of solar heat that gets reflected back into space. (2) They precipitate out as rain. More clouds, more rain. That would seem to militate against the droughts you’re predicting. (3) The water vapor in those clouds is coming from somewhere. That predominately will be the seas. Less water in the seas should imply *falling* sea levels, not rising. Does it not come back down? So we get your predicted droughts but falling sea levels? Or does it come down (as increased rainfall)? So we get your rising sea levels, but no droughts? Uh, no. I’d say genetic mutations would be a better culprit, even if that’s not the case–yeah, there were no scourges or plagues prior to man’s modern inventions. I’m sure there are plenty of folks in Europe who would call out your historical ignorance on that. Nonsense. The private sector invests at lot more efficiently & is a lot more voluminous when it comes to infrastructure investment. Where have you been living? See my article on this http://www.freewebs.com/professor_enigma/infrastructure which debunks your ignorant claim. Uh yeah, I’ve read a lot of those “scenarios” (Paul Ehrlich anyone?) from various sources, it’s a lot of scaremongering. I guess Pedro has NEVER looked at N. Hemisphere snow coverage over the past few decades. Pedro’s ignorance should be taken w/ a large grain of salt. I find this assesment of yours to be impossibly naive. At best. The opening summary of “climate change will barely slow our progress in the effort to raise living standards” is based on a false dichotomy. The touted “standard of living” is a poor yard stick of the problems we face- the yardstick would perhaps more appropraitely be termed “quality of life”. You skip over the fragility of ecosystems, as if we are independent of the notion of carrying capacity. A world of dead oceans, dessicated lands, unstable erratic climate and weather, you look at with the eyes of a man who has suffered a complete failure of empathy, imagination, and frankly shows no understanding of biology or the basic notion of a “food chain”. You raise the issue of carrying capacity. Prior to about the 1750’s / the beginnings of the Industrial Revolution, the Earth had supported about 2 billion people. On average, they lived on about $1000 / year (2015 dollars), frequently perished from starvation, and had a 30 to 40 year life-span. After the Industrial Revolution — overwhelmingly powered by fossil fuels — the Earth supports some 8 billion people. Average income is about $3000 / year, starvation is disappearing, and lifespans average 60-70 years. Going back will require a tyranny to impose that. Why do you argue for a bayonet at the base of your skull so that 3/4 of the world’s people must die, and the rest be impoverished? You raise the issue of the Earth’s carrying capacity. Before about 1750, the Earth supported about 2 billion people. Average per capita income was about $1000 per year (2015 dollars). Average lifespan was between 30 & 40 years. Starvation was common. It had been this way for eons. After the Industrial Revolution, human living conditions improved remarkably. Today, the Earth supports nearly 8 billion people. Their average per capita income is about $3000. Their lifespans vary between 60 & 70 years. And starvation is becoming vanishingly rare. I apologize for the double post. Some hours after the first post, it still had not appeared. I assumed the editors had found it too harsh and banned it. And so I prepared its more temperate brother which you see here. Again, my apologies. You were going pretty good there for a while. Then off the rails you went. Please stick with citations of scientific and historical data. Leave the political rants to the Fox News blogs. As a member of the Right, you have no idea of the intentions of the Left, which is no more monolithic than your side. As for your point, as they say in fund prospectuses, past performance is no guarantee of future gains. Moral of this story: Don’t lose your head, but don’t bury it in the sand, either. Just use it to help us out of this mess. We can do it! One critical omission that needs to be addressed. How will we ski? This is a truly remarkable, eye-opening article. It certainly challenged my worldview and made me think critically. The only question I have the was left unanswered was the issue of biodiversity. Every issue you discuss in the article is regarding human-caused issues that can be human-solved. Perhaps this is also the case for biodiversity loss, but it does seem to have a distinction. It is well established that many species will be unable to adapt and survive climate change. This is in-part due to habitat loss, but temperature change, ocean-acidification, and other causes attributable to carbon and climate change will likely cause the extinction of many species across trophic-levels. How would you respond to this issue of biodiversity loss? Is biodiversity loss distinguishable from the issues you present, or is it equally solvable? Please feel free to challenge any of my assumptions or claims. I am genuinely curious. I found this article incredibly eye-opening and thought-provoking. Thanks! So this post is over-optimistic, but that’s pretty common for someone from the Breakthrough Inst. David, I don’t think the loss of ecosystem services from global warming will pose much risk to human welfare. 1. The Costanza estimates that you cite are kind of squishy. Their 1997 paper cites a range of values for ecosystem services from $16 trillion to $54 trillion, with an average of $33 trillion, and benchmark that against world GDP of $18 trillion. But that GDP figure seems too low; World Bank data put 1997 nominal global GDP at $31 trillion. So Costanza may have exaggerated the disparity between ecosystem GDP and human GDP. 2. Costanza’s accounting includes a lot of ecosystem services that aren’t essential but that really inflate the nominal value. For example, under the category of marine ES, the dollar value they assign to “cultural” and “recreational” services provided by oceans is larger than the dollar value of “food production” services. 3. Since 1997, world real GDP has risen by 73 percent in constant 2010 dollars, and nearly doubled in terms of purchasing power parity. Presumably the ecosystem has not increased its production since 1997 (it’s probably lost some because of human encroachments). So the relative size of eco-system contributions to human welfare has shrunk a lot since 1997, and is certainly no longer twice the size of the human GDP by Costanza’s accounting. ES will continue to shrink relative to global GDP in the coming century. 4. Much of world GDP growth has enabled humans to substitute and replace ecosystem services, further marginalizing their importance to human welfare. In Israel, for example, a large share of the water-provisioning services that used to be supplied by the ecosystem’s rivers, lakes and aquifers are now supplied by desal plants. 5. Climate change isn’t going to completely eliminate ecosystems. Most of what they provide to us now they will still provide after global warming. 6. Given all this, the idea that climate change will deprive us of ecosystem services to a degree that will really harm us seems pretty far-fetched to me. Right, loss of biodiversity is a serious issue. I don’t think it presents a substantial threat to human material interests. (We actually rely on a pretty small group of plants and animals to sustain us, and we are good at nurturing them in all sorts of conditions.) But just as climate change will drown coastlines and cities that we cherish, so it could destroy some biomes and species that we value as well. That should weigh in the balance when we consider how fast decarbonization should go. We can help mitigate global extinctions with targeted interventions. Biologists are discussing plans to save polar bears by dropping food to them when the ice won’t support seal-hunting. We may also set up preserves in northerly latitudes to transplant species that are threatened by warming. But again, we need to get some perspective. The impacts of global warming pale beside those of farming, fishing and logging, which are far and away the biggest anthropogenic threats to biodiversity, and getting bigger as populations rise. Actions to limit the extent and impact of those activities will probably be more important than forestalling climate change in preventing species loss. For example, intensive aquaculture may enable us to restrict commercial fishing or ban it altogether, which would ease pressure on ocean wildlife. Raising agricultural yields can limit the land that goes under the plow and thus let us preserve or restore wild habitat. Biofuels, a nominally “renewable” energy source, have a huge and very destructive land and environmental footprint, and there’s a strong case for banning them on biodiversity and other grounds. We need to make sure that decarbonization policy doesn’t unintentionally work against other environmental goals. Thank you for addressing biodiversity. It was the one thing I noticed you didn’t address. Also, thank you for helping to solidify why I have been feeling so skeptical about policy and yet I can’t deny the science. Was feeling like I was approaching cognitive dissonance. No, Pedro, AIDS and ebola are not caused by climate change. Probably mainly surfactants (detergent), mild acid, and proppants (sand). Aquifers are not fracked. Fracking depths are typically way below the aquifers. So that “concern” is misplaced. In some places, well water naturally bubbles with large amounts of methane. Years ago, on my great uncle’s farm near Brook, Indiana, their water well and pump were housed in small wooden “pumphouse” structure separated from the farmhouse. The pumphouse roof wasn’t fastened to the walls, because so much methane bubbled out with the water that it had a tendency to accumulate in the shack and occasionally explode. My uncle intentionally didn’t attach the roof to the walls, so that when it exploded it just blew the roof off without knocking down the walls. That’s all contra-scientific nonsense. The reality is that higher CO2 levels are greening the planet, improving agricultural productivity, causing deserts to retreat, and making most plants more drought-tolerant. The only important impacts of higher CO2 levels, thus far, are very positive. All the significant “negative effects” are hypothetical, but the > +15% increase in agricultural productivity, and the dramatic greening of the the Earth, are real, and well-measured. Here’re a couple of articles about what CO2 emissions are doing to the environment. The 2nd one is National Geographic. “’Before, there was not a single scorpion, not a single blade of grass,’ he said. ’Now you have people grazing their camels in areas which may not have been used for hundreds or even thousands of years. You see birds, ostriches, gazelles coming back, even sorts of amphibians coming back… The trend has continued for more than 20 years. It is indisputable. I didn’t add the word “indisputable,” it’s in from the article. low-flow shower heads? why? why would anyone want or need low-flow shower heads at at $715 per acre-foot of water ? Low-flow shower heads are a manifestation of left wing authoritarianism that you should be railing against, not citing as evidence of progress. No one buys them voluntarily. They are forced on an unwilling public. It is against the law to manufacture or sell higher flow shower heads. Due to legislative over-reach, people are forbidden to make their own decisions about how much water they want to use when they take a shower. It’s their shower, and it’s their water bill. Let them make up their own minds. There is no valid physics supporting the contention that radiation from one molecule of cold carbon dioxide in every 2,500 other air molecules can cause heat transfer into the warmer surface and thus raise the temperature. Long-established physics may be used to explain why greenhouse gases can only COOL us, which is why rain forests are cooler than deserts at similar latitude and altitude. For the correct science visit my website.